This year, PRISM sent two members with mentor, Prof. Artem Domashevskiy, to the EB Conference. Valentina Aitbakieva presented a poster on her work, “Isolation and Characterization of Different Isoforms of Pokeweed Antiviral Protein (PAP) from Phytolacca americana,” and David Rodriguez presented a poster on his work, “Studying Interactions Between Pokeweed Antiviral Protein (PAP) and Fluorescently Labeled Tobacco Etch Virus RNA.” PRISM was also able to send an additional 3 students this year, Karen Conrad, Porfirio Fernandez, and Derek Sokolowski as conference participants even though they did not present their work. The National Conference on Undergraduate Research (NCUR) is an interdisciplinary conference where students representing universities and colleges from all around the U.S., and internationally, present their research and creative works in oral, poster and performance/visual arts presentations. This year’s conference took place from April 16-18 in Spokane, WA. PRISM was able to send Imani Hargett, who presented her a poster on “The Perceived Educational Barriers and Persistence of Minority Students in a STEM Major at John Jay College.” She works under the mentorship of Prof. Lissette Delgado-Cruzata. Imani had this to say about her experience.. The 2015 Society of Toxicology (SOT) Conference was held in San Diego, CA from March 22-26. The SOT Conference is the largest conference of its kind, bringing together the top toxicologists not only from the country but from around the world. For our students, it is a unique opportunity to mingle among their field’s leading scientists and share new ideas. This year, four PRISM students attended and presented posters about their scientific research at John Jay. These students were Anna Lerer from Dr. Lents’ lab, and Yessenia Lopez, Jiwon Seo, and Jazlene Montes, representing their mentor Dr. Demi Cheng, who accompanied the students to this conference. PRISM was also able to send four additional students, Danielle Rouse, Richard Khusial, Shawn Williams, and Shari Yarde, who were able to benefit from the conference experience, even though they were not scheduled to present there this year. 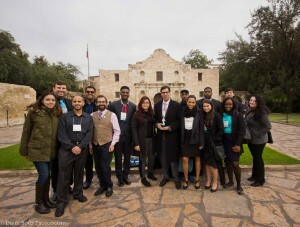 The 14th Annual Biomedical Research Conference for Minority Students (ABRCMS) was held in San Antonio, Texas earlier this month (November 12-15). Twelve PRISM students attended, presenting posters about their scientific research at John Jay. Click here for a complete recap of the ABRCMS conference, more pictures, and student accounts. Andre Rozado, who works with Dr. Nathan Lents, presented his work, “Regulation of CCN2 and CCN3 in bone marrow through myloid zinc finger-1 and its medical implication in hematopoiesis,” at the EB Conference, April 26-30, 2014. The Society of Toxicology (SOT) Conference is the largest of its kind for this discipline. SOT brings together 6,500 toxicologists from more than 50 countries. In 2014, it was held March 23-27 in sunny Phoenix, AZ and some of the toxicologists in attendance were our own PRISM students: Christine Ta, Bik Tzu Huang, Jazlene Montes, and Yessenia Lopez, as well as mentor, Dr. Shu-Yuan Cheng. Who better to get the details from than the student attendees themselves? Click here to read their first hand accounts and for a link to more pictures. PRISM students, Stacey Ishmail, Kitty Law and Shoronia Cross and their mentors attended the AAFS Conference in Seattle, Washington, February 17-25, 2014. Shoronia, who works with Dr. Marcel Roberts, presented a poster, “Electrochemical Detection of Explosives and Their Metabolites in Fingerprint Sweat Using Molecularly-Imprinted Polyaniline Films,” at this prestigious conference. Professor Peter Diaczuk, who mentors Stacey and Kitty, presented on his work that demonstrates the potential to discriminate between shotgun shell buffer material used in different ammunition types and manufacturers. Prof. Peter Diaczuk and his two students together at the AAFS conference. Shoronia Cross with his poster at the AAFS Conference.